Irrespective of the project scale, construction industry requires effective and reliable equipment to manage the loads. GC URALKRAN is ready to provide developers of all types with modern equipment, employed for: erection of low-rise, framed and frameless buildings and constructions of various purposes; building bridges and otherconstructions. The production conforms, to GOST 4.22-85 Quality ratings system. Load-lifting cranes. Load capacity calculation, development according to the questionnaire, manufacturing, delivery, erection, assistance in certification by Federal Service for Environmental, Technological and Nuclear Oversight of Russia, maintenance and repair of tower, gantry, self-lifting, single-girder and double-girder building cranes. Also we perform disassembly of equipment upon work completion. Providing construction sites with traveling, stationary, attachment, self-lifting tower cranes with saddle jib. Manufacturing, delivery to the place of operation, setting rails for traveling of the overhead cranes bearing beams on trestles or walls of the building, crane runway installation for top-running crane beam in closed or semi-closed areas. Delivery and erection of gantry cranes, used for building prefabricated industrial and civil facilities. Installation and dismantling of self-lifting cranes upon completion of building. The equipment is erected directly on load carrying structures of the building, and progressively, as the construction is built, moving vertically up by means of hydraulic mechanism. Procurement of the existing crane equipment with additional devices - load hooks, magnets, winches, clamshell buckets, etc. Construction cranes maintenance and repair on the construction site. Upgrading construction cranes for the purpose of efficiency improvementof the equipment. Delivery and erection of load-lifting equipment on the construction sites on turnkey basis. 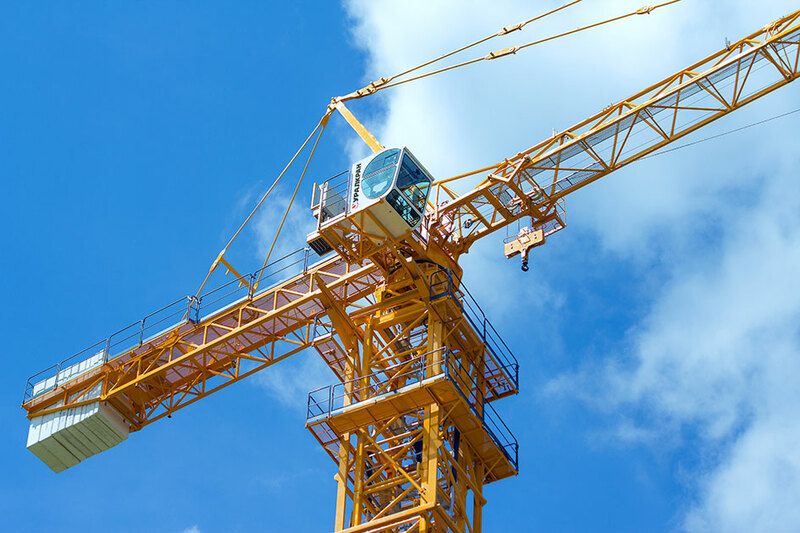 Selection of the crane type is performed considering the category of the construction or building, its design dimensions, maximum weight of prefabricated elements, construction techniques and location of the load-lifting equipment on the general plan of the developed area. Apart from that, the equipment must perform all of the technology processes that are listed.